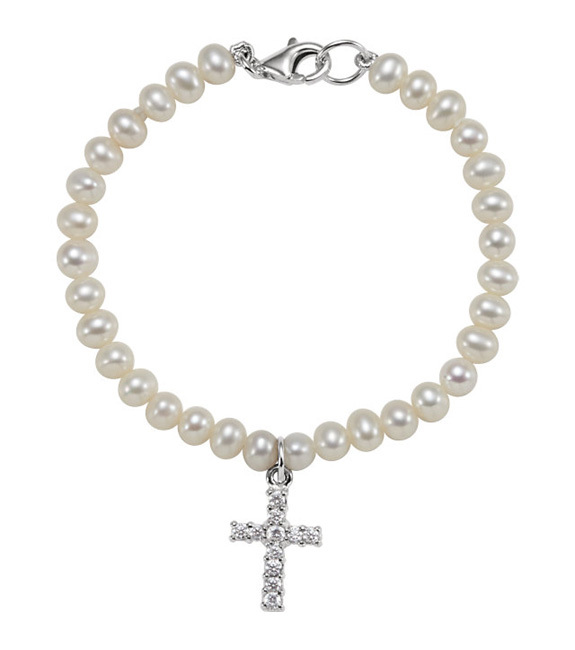 A strand of freshwater pearls adorn this bracelet with a Christian cross in .925 sterling silver. 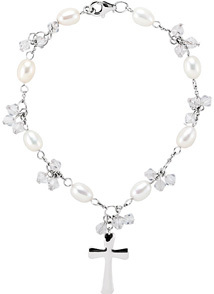 Each pearl measures 4 - 4.5mm in size and there are a total of 32 white pearls on the bracelet. The cross is also studded with white cubic zirconia stones for added luster and shine. The bracelet includes a secure, lobster claw clasp. Wear it with matching freshwater pearl and cross earrings in silver, shown below. Also wear it as a daily reminder that with Jesus Christ at our side, "I can do all things through Christ which strengtheneth me" (Philippians 4:13). We guarantee our Freshwater Pearl and Cross Bracelet in Silver to be high quality, authentic jewelry, as described above.